We are in the throes of developing a kitchen garden, with the primary goal of reducing the costs of buingy our fruit and vegetables from shops. On a deeper level, we would like to create a natural environment for the children’s education. It is our belief that greater contact and engagement with nature leads to greater maturity and realism for a child, not to mention the positive effects to their well-being (both physical and psychological health). Next to our organic kitchen garden we are also developing a small farmyard area (5 ducks, chickens, turkeys, rabbits – 5 of which have unfortunately recently died – and budgies). The children are becoming ever-increasingly fond of working in the garden in the evenings and after school. 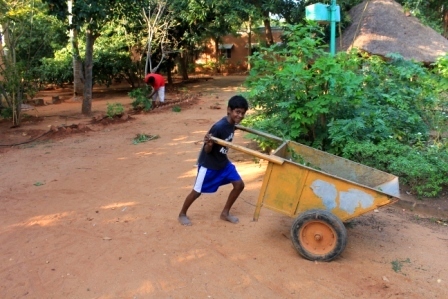 Sachin and Santhosh have a keen interest in the garden and Akash is also fairly dedicated. Our long-term vision is that the kitchen garden might one day be a source of income for the orphanage, and we also hope it might bring about greater culture in Mathur. 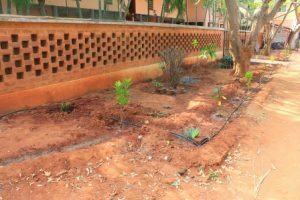 At Nava Jeevan (the house for teenagers) we have already finished pruning, erecting a fence and installing the necessary pipe work around the designated area of land. On both parts of the land we now need to make something in the region of 800 holes, this making it necessary to purchase an auger. For if we were to pay outside-labor to do the task, it would cost on average 17.5 Rupees a hole, totaling 14000 Rupees (or 193 Euro). 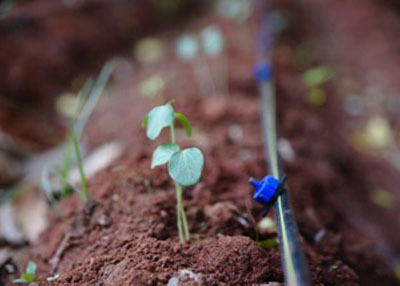 Given that we will need to re-dig these holes every harvest and also make them on the land at Jeeva Nivas (the house for children), purchasing an auger is most cost-effective. The children benefit from a large supply of milk, freshly delivered every day and then boiled. The annual cost of supplying the milk, however, is not cheap, and currently costs us 250 000 Rupees. The objective of purchasing cows is therefore twofold: on the one hand we substantially reduce the cost of milk, and on the other it enables us to develop a smallholding, which will provide work for the young people from Shanthi Bhavan Children’s Home who would not otherwise have the opportunity of finding employment. The purchase of one cow (race country) costs 10 000 Rupees, and that cow should produce in the region of 7 liters of milk per day for 6 months of the year. 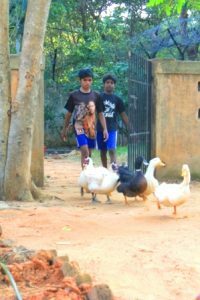 Our plan is to buy 5 cows, which will be looked after by Venkatesh, who will take them to pasture in the vacant fields surrounding the orphanage. As part of the development of our smallholding, we will substantially reduce our supply bill by purchasing a thermal wood chipper, which will enable us to recycle the branches and leaves from both gardens.